It is essential that every fruit tree in your yard is suitable for the climate, soil and location in which it is placed. A great variety of fruit trees can be grown in Melbourne’s temperate climate, including bananas if they’re in a warm, protected spot. Most fruit trees prefer a full day’s sun (or close to it) throughout spring, summer and early autumn. Fruit will not ripen if it does not receive enough sunlight. Evergreens such as feijoas, citrus and loquats need winter sun too. Most fruit trees prefer to be in a wind-protected spot, and a spot where they will not be effected by frost in early spring. 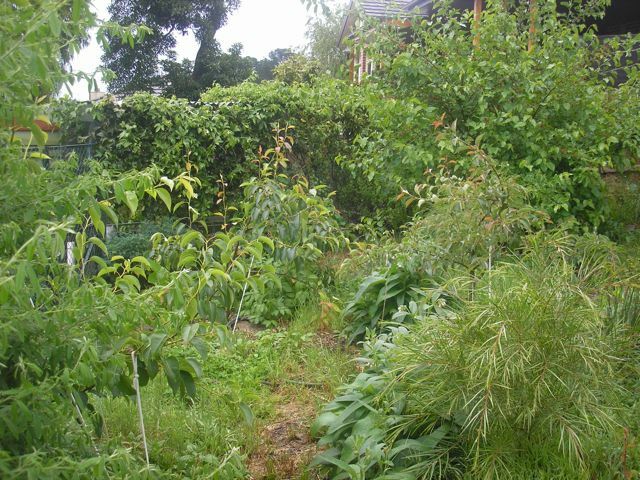 Fruit trees do not like to compete with grasses in their root-zone. Mulch or ground-cover plants should be placed beneath fruit trees. Alternatively, you can use chickens to keep the grass down. In their establishing years for survival, and in later years for maximum fruit production, fruit trees will require regular watering, particularly in spring and summer. All fallen fruit must be quickly picked up and either used or composted. This is to prevent pest insects from building up. Alternatively, if you have chickens, let chickens run beneath your fruit trees to eat the fallen fruit and convert them to a great fertiliser. Most fruit trees do not like heavy clay soils, as they do not drain well and can cause roots to rot. Before planting, mix compost through the soil in and around the planting hole. Build up a mound of loose friable free draining soil (once again including lots of compost) in which to plant the fruit tree. It helps to shape the mound like a volcano with a crater in the middle so water doesn’t run off. In some cases digging in drainage trenches filled with gravel is a good idea. Very sandy soils are also problematic, as they hold less moisture and nutrients for the trees. Once again solutions can be found in good compost. Dig a deep hole and mix compost through the soil below and around your new plant. Mulch heavily. You’ll need to water more regularly, but once established your fruit trees will do fine. Lavender and rosemary shrubs, and a range of daisies are great to plant near fruit trees to attract pollinating bees and other good insects, while deterring pest insects. Warrigal greens (also known as native spinach) can form an edible, grass suppressing ground cover, and comfrey is a top-notch nutrient cycler we use extensively. Alpine strawberries and violets are a couple of hardy and edible groundcovers that can suppress weeds. For that shady spot in your yard, currants and tamarillo will still supply fruit if placed in a partially shaded position. Among fruit trees apples and plums are more shade tolerant than most. are best planted in mid-winter while they are dormant. You can buy them cheaply as ‘bare-rooted’ trees at this time, and more varieties are available. are available as dwarf trees, reaching only 3m in height – great for small backyards. Dwarf trees can be grown in a large pot if they are pruned well. With spring-summer pruning you can keep any tree to dwarf size though. do not need to be fertilised or watered between mid-autumn and mid-winter – they are asleep in these months. Fertilise in late winter. you’ll have to prune to contain or shape the tree, and to stimulate new fruiting growth. While traditionally fruit trees were pruned in late winter while dormant, this stimulates growth in the growing season whereas spring-summer pruning can be useful for keeping trees to a desired height. Some useful books on pruning include Pruning: A Practical Guide by Rodger Elliot (1993), The Pruning Handbook by Steve Bradley (1996) and the CSIRO publication Pruning for Fruit and Flowers by Jane Varkulevicius. 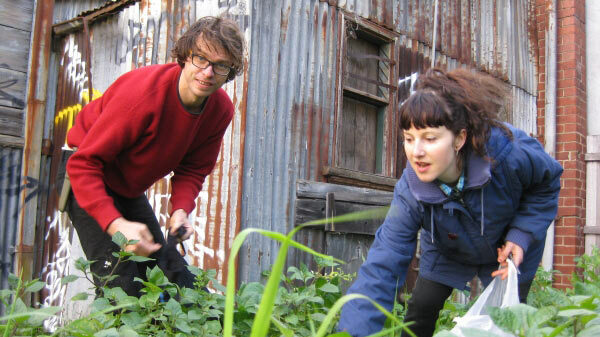 You can also hire the VEG team to prune your fruit trees and mentor you. are often grown in a vase shape (with inward facing branches removed), so that all branches receive a good amount of sunlight, and do not rub against each other. This is especially true of stonefruit. can be grown rather flat along horizontal wires (eg. along a fence or a wall) – this is called espaliering. See The Australian Fruit and Vegetable Garden by Clive Blazey and Jane Varkulevicius, published by The Diggers Club, 2006. There’s an approach to backyard orchards called Backyard Orchard Culture. Read an excellent article about it here. A central idea we use in many of our orchards is multiplanting (up to four fruit trees in the same hole as an alternative to multi-grafted trees). This can be useful for getting a range of fruit from a small space and for getting cross-pollinating varieties in a small space. will fruit all year round, or for extended periods. need to be placed in a sunny spot, where they will also receive winter sun. like to be fertilised in late winter. Citrus trees are heavy feeders so fertilise well, and fertilise more often if the tree is looking stressed. prefer a soil with good drainage – slightly sandy is ideal, and if you are on clay soil, you need lots of organic matter. If you have a warm frost free area (for instance along a north facing wall with good winter sun) you can grow various bananas and other subtropical fruit such as babacos (a type of papaya), cherry guavas and a range of other plants like taro, lemongrass and galangal. These plants are shallow rooted and like lots of water, nutrients and compost! This is a five-year old orchard we designed in Melbourne’s Eastern Suburbs.